Free PSD Design Team Once again Came up with the design for the Real estate brokers and online Real Estate firms Who providers Luxury House/Flats/Banglows/Penthouse etc For Rent or Sale. The Design concept is for Real estate brokers, Design with eye catching color combination, flexible, pleasant and resourceful highly imaginative theme design for Real estate brokers Design PSD. Real estate PSD Design is Equipped with Full custom searching Form which is user friendly design to showcase all your services viz. Rooms,House, Flats, Banglows, Penthouse etc. 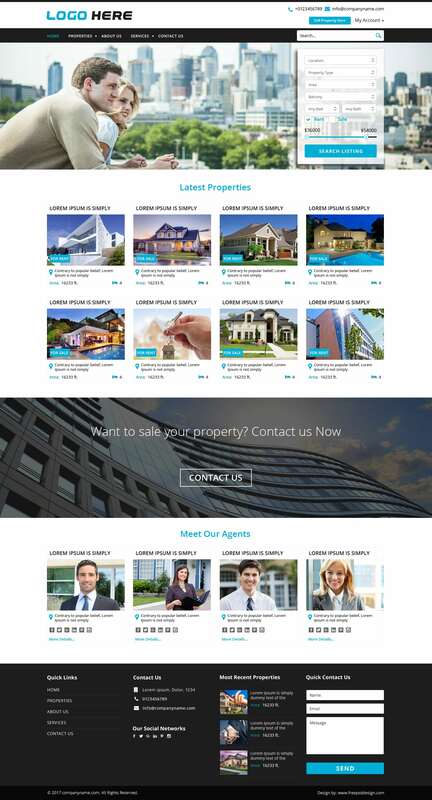 Free PSD Design team is came up with Real estate brokers and online Real Estate firms design PSD that will showcase all amnesties offered by you and easy to explore from our custom searching form design.